When I posted about Dutch Baby Pancakes on my Instagram stories, a lovely Dutch lady asked me why is it called Dutch since had never seen any Dutch pancake look like that. Since I had no answer to her question, I did the obvious and I Googled. Surprisingly, Dutch Baby Pancakes is also known as German pancake, Dutch puff, and Bismarck, and the surprising factor here is that it’s of American origin. To be precise – it most probably originated in Pennsylvania. When I relayed the same to Violet, the Dutch lady, she laughed saying it’s weird and it was probably invented by the Dutch settlers in Pennsylvania. I Googled that too and apparently, one of the oldest recipe posts related to Dutch baby pancakes was written by a homebaker who had learnt the recipe from a Pennsylvania Dutch Cookbook and how it was cooked using a cast iron skillet. Mystery solved! It’s been a dream to own a cast iron skillet someday to be able to bake Dutch Baby Pancakes and so much more! I recently ordered a cast iron skillet and this had to be the first thing I baked with it. This is a very simple recipe. But yes you will need either a cast iron skillet or any oven proof pan for it. 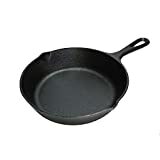 You can buy this cast iron skillet from my Amazon Store . It’s 6.5″ in diameter and fits well into my oven. If you’re wondering what oven I use, you’ll find that on my Amazon Store as well. Lately, I simply love enjoying something sweet with a cup of black coffee. How did I get seduced into lusting after this combo?! I’ll never know! Preheat your oven to 190C. Place your cast iron skillet in the oven. In a separate bowl, whisk up the sugar, egg, 1 teaspoon melted butter, vanilla, and milk. Add in the flour mixture. Whisk till smooth! Get the skillet out of the oven carefully. It should be hot! Add that 1/2 teaspoon of butter. It's going to sizzle! Spread it around using a spatula. Pop it back into your preheated oven for 10-12 minutes or till the top is golden and the edges are golden brown. Serve hot! With or without toppings is totally up to you. Add everything except corn starch (or all purpose four) to a saucepan. Bring it to a boil over medium heat. Add corn starch (all purpose flour) to thicken it. Whisk everything. Once thick, turn off the heat. It's ready for use. For toppings - you can use anything you want. Fruits, syrups, honey, melted chocolate, ice cream, the possibilities are endless. You can simply enjoy the pancake as it is, in all its buttery goodness. Maybe with a hot cup of (black) coffee. Yum!